This page details our current stock of Panasonic Triple Chip DLP / System projector lenses for models including the PT-DZ21k, PT-DS20k, PT-DW17k, PT-DZ16k, PT-DS12k, PT-DZ13k, PT-DW11k, PT-DZ10k and the PT-RZ31K. We have the HD versions, models ET-D75LE6, ET-D75LE10, ET-D75LE50 (short throw), ET-D75LE30, ET-D75LE40 (long throw zoom), ET-D75LE90 (ultra-short throw), rather than the old model numbers (ET-D75LE1, ET-D75LE2, ET-D75LE3, ET-D75LE4, ET-D75LE5, ET-D75LE8), although the lenses are compatible. We stock multiples of all these lenses and can source additional units if required. We offer a UK wide Panasonic lens rental service at competitive rates. Zoom lens 1.4-1.8:1. Motorised zoom and focus. Fits models including PT-RZ31k, PT-DZ21k, PT-DS20KU / PT-DS8500U (1.4 - 1.8:1), PT-DW17KU / PT-DW8300U (1.4 - 1.9:1), PT-DZ21KU / PT-DZ8700U (1.3 - 1.7:1). HD lens. Click here to request a rental quote. Motorised zoom lens with throw ratio 2.4-4.7:1. Motorised focus. HD lens. Motorised zoom lens with throw ratio 4.6-7.4:1. Motorised focus. HD lens. 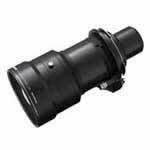 HD lens for triple chips, fixed at 0.8:1 for the PT-DS20KU / PT-DS8500U / PT-DW17KU / PT-DW8300U models, or 0.7:1 for the PT-DZ21KU / PT-DZ8700U projectors. Motorised zoom lens with throw ratio 1.7-2.4:1. Motorised focus. HD lens. Throw ratios: 0.9-1.1:1 (16:10 Ratio) / 0.9-1.1:1 (16:9 Ratio) / 1.1-1.3:1 (4:3 Ratio). Motorised zoom and focus. HD lens. 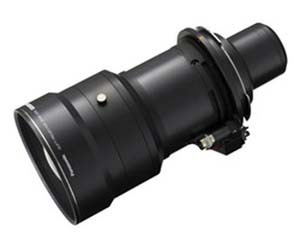 Panasonic ET-D75LE8 Extreme long throw HD lens for Triple-Chip/System Units. A long throw HD zoom lens for the Triple-Chip DLP and system projectors including PT-DZ21K, PT-DS20K, PT-DW17k. Throw ratio 7.3 - 13.8 : 1. Panasonic ET-D75LE90 ultra-short throw HD lens for Triple-Chip/System Units. Fixed extreme short throw HD lens offering a throw ratio of between 0.36: 1, to fit the Triple-Chip units, including PT-DZ21K, PT-DS20K, PT-DW17K, PT-DZ16K, PT-RZ31K. Legacy Panasonic projectors that will accept these lenses include: PT-D10000, PT-D10000E, PT-D10000U, PT-D12000, PT-D12000E, PT-D12000U, PT-D7500U, PT-D7600U, PT-D7700, PT-D7700U, PT-DW100, PT-DW10000, PT-DW10000E, PT-DW10000U, PT-DW100U, PT-DW7000, PT-DW7000U, PT-DW7000U-K, PT-DZ12000E, PT-DZ12000U, TH-D10000, TH-DW10000. Please feel free to contact us for a competitive on any longer term hires, or where you are unsure of which lens you may require and we will be happy to try and help. We offer a UK wide next day courier delivery service.